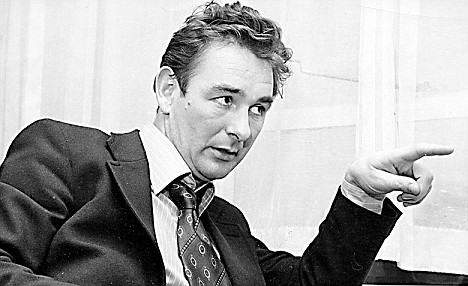 I’ve written a few words on the subject of Brian Clough on occasion and I’ll make little excuse for doing so again here. Last evening, ITV showed the documentary ‘Clough’ at 10.35pm and I looked to the TV schedules without too much hope of witnessing a new angle about the man. The documentary was ostensibly about the new movie based on the best-selling book by David Peace, The Damned United, a part-fictional work on Clough’s infamous 44-day reign as manager of Leeds United in the 1970s’. It was well-publicised at the time of the book’s release that members of Brian Clough’s family were unhappy about the ‘fictional’ report of his short stay at Elland Road over three decades ago. His widow, Barbara received a forum in this documentary to voice her own great disappointment at the way her late husband had been depicted, as did Brian’s son, former Forest and Liverpool player and now Derby County manager, Nigel Clough. At last it has happened. I was pleased to note whilst making my way through a busy lunchtime Nottingham today that a large crowd was gathering for the commemoration of one of Nottingham’s favourite adopted sons, football manager, Brian Clough. The eight-foot high statue stands in a prominent position at the juncture of King Street and Queen Street, just adjacent the city’s Old Market Square. Among the gathered throng for the unveiling were many players from Brian’s illustrious career, including individuals from his great European Cup winning teams such as Tony Woodcock, Viv Anderson and Kenny Burns. Brian’s lovely widow spoke for the first time about the tribute to her husband and revealed a side to the great manager that few in the public eye were aware of. The video shows various moments from Brian’s glorious managerial career and brings back many fond memories of great football and great celebrations. It hardly seems possible that this disaster happened the best part of two decades ago. Living in Nottingham, I had quite a few friends at the game following the Forest that fateful day. They all told the same tale – that they knew little of what was going on down at what became the infamous Leppings Lane end. As the tragic events unfolded, many Forest supporters began to boo as they had falsely imagined that the Liverpool fans were merely causing a crowd disturbance. A friend told me that the first he realised that a tragedy was unfolding in front of him was when a young man was brought around the pitch in front of where he was, apparently dead, laid out on an advertisement hoarding which was being used as a makeshift stretcher. Soon there was a frightened hush amongst the Forest support as the hapless struggle went on to release the poor souls trapped behind those high fences. I’ll lay this on the line straight away. Jim Baxter was a hero of mine. The reasons for that are many but in simple terms it was because my father worshipped him and this suggested that I ought to too. Another reason was simply because Jim was absolutely brilliant. There, now I’ve got that out of the way I’ll begin. Much of Jim Baxter’s story as a player with Glasgow Rangers, Sunderland, Nottingham Forest and Scotland is fabled stuff. As always I won’t head in the direction of a detailed resume of his life or career as that has been covered by many. I’ll alternatively offer an individual take on a man who entranced the world of football during the 1960s. One who passed through that decade’s football folklore like a shooting star. A very brilliant star at that. As a young man growing up in Hill O’ Beith he was a Hibernian fan, admiring the stellar forward play of the Hibees’ Famous Five. And what football! On a ‘research study’ at my favourite watering hole The Woodlark at Lambley, (tours available), I ‘nebbed in’ as they say in these parts, on a conversation between some worthies sitting in the bar who were talking of some sterling names from the local football fraternity. Totally ignoring my partner of course, I listened in with glee as the names of Jim Baxter and Joe Baker dutifully came to bear upon proceedings. That Nottingham Forest in particular have much indebtedness to players from north of Hadrian’s Wall is not lost on most knowledgeable Forest fanatics to their great credit. The talk was of ‘Slim Jim’ and hi s magic left foot which he self-christened ‘The Glove’. Interestingly Iit seemed lost on these local men after the decades had passed on how Jim struggled in the Garibaldi Red of their beloved team, (mainly due to the wonderful social life James Curran Baxter had sought out in the Lace city). Another Baxter story was of him addressing the apprentice boys in the Nottingham Forest dressing room, requesting them to ‘fetch my magic wands’ – to bring his boots to him! Jim was known to be fond of the odd Bacardi and Coke and found a terrific ally in Garfield Sobers, the greatest cricket player that ever lived and also a world class drinker. Together as the famed ‘Drunk n’ Sobers’, they toured the fleshpots of Nottingham in spirit-infused abandon and no little debauchery. Famously after one nightclub scrape, former former Black Watch recruit James had to be picked up out of the gutter by the genial Forest coach, Irishman, Tommy Cavanagh in the early hours. On this occasion Jim had taken on one too many doormen and come off worst, so bad in fact that his teammates were not allowed to see the state of him for the next two weeks as he was ordered to train on his own. In those days the local Nottingham Evening Post would often report that Jim was ‘two or three moves ahead of his teammates’ in thinking. Forest had a team on the wane when Jim arrived and his football brain, though let down by his physical condition, was still razor sharp. He didn’t flourish in Nottingham but rather showed odd flashes of his genius which some still talk about. 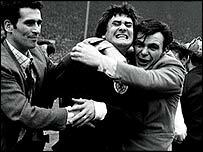 Jim Baxter was like no other football player I’ve seen. He seemed to almost glide across the pitch and was always in the right place at the right time. That left foot was a stunning yet delicate tool. Its brush strokes creating small masterpieces whenever he was on the ball. Jim would read the game very well and ‘see’ a pass where others wouldn’t and slide it through with precision weight and accuracy. I don’t think I’ve ever seen a player with a finer touch, one so deft. Of course orchestrating two Scotland victories over England at Wembley in 1963 and 1967 (and humiliating them in the process in the latter game) elev ated Jim’s standing in our house to astronomic status. He made our dreams into a reality. He was the elegant rapier that cut and tore England to pieces with his cavalier midfield play, prompting prodding and waltzing around the England rearguard in elegant style. Punishing them into submission. How could we not love him? Jim will always be immortalised for that heroic display in 1967. The other thing he will always be known for is for kicking his career away at a very early age. His drinking was almost as accomplished as his football, the former finally overruled the latter as he attempted one last hurrah at Rangers after Forest freed him. Jim was very frustrating in some ways. You just wanted him to play football forever but that was never his style. It was sad to see his self-imposed health and weight problems as he got older. It was also easy to forgive him too. he never showed any regret for his lifestyle and we should remember he left his elegant footprint on football more than most. He will always be remembered. Thanks for the memories Jimmy Baxter – you were simply sublime. Tell of us of the day? Did they try to stop him playing”? Keepie uppie… is it called? How did it end up”? But how the hell did Scotland win it? T’was Jim Baxter in a dark blue shirt….. finest ninety minutes”! I noticed an interesting comparison online recently and it set me casting my mind back some years. In the light of some superb results of la te and in particular yesterday’s vanquishing of the hun, a Hibby was prompted to relate the present-day abilities of the Hibs team and management in comparison to the Nottingham Forest side that conquered Europe with two European Cup wins and several domestic trophies. Some of the similarities drawn were of smallish squads, tight discipline in the players and similar budgets. Having had the pleasure of watching that great Forest team week in, week out, I’d like to offer the following comparison. An unusual title you might say but allow me to explain as all will be revealed! Peter Barr Cormack was one of my three favourite Hibees of all time along with Joe Baker and Alex Cropley. All very different players but owning a little genius each in their own way. 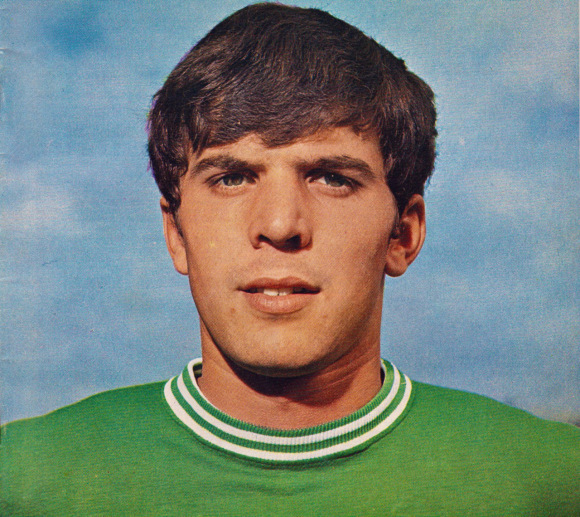 Like the aforementioned Joe, I had the great pleasure of watching Peter play both with Hibernian and Nottingham Forest to whom he was transferred to for £80,000 in 1969. From a very early age Peter displayed a maturity beyond his years. His legendary debut against Real Madrid in which he debuted with a goal in Hibs’ 2-0 victory is well-charted in the history of notable moment in the club and what an amazing feeling that must have been for the young Peter Cormack. Much more was to follow in a distinguished career for the good-looking young man with the shock of dark hair, bursting into Hibernian’s ranks. I have often talked with interest about Peter with other Hibbies who managed to watch him in his prime. It seems that everyone who saw him had an opinion about him, particularly about the unique way in which he moved about the pitch. One friend, a Portobello man, related to me once about how he would watch Peter Cormack at Easter Road from the East Terrace and skip all the way back home to Porty after the game, imitating Peter’s trademark high-stepping gait. Peter had this appearance of kicking his legs up high behind him when he ran – a run that was always instantly recognisable amongst a group of players in the middle of a game. I recently spoke to another long-time supporter who likened Peter’s run to that of a racehorse galloping! Here was far more to Peter Barr Cormack than an unusual run however as he was to show. Whatever persuaded Hibs to offload their talented young player I’m not really sure. I’ll make the standard conclusion that the board at Easter Road wanted or needed to ease Hibernian’s cash flow – there could be little other reason as Cormack began to show, growing in stature in the original English Division 1, firstly with Nottingham Forest, then with a powerful Liverpool side, led by the legendary Bill Shankly – perhaps no mean judge of a player one might say. 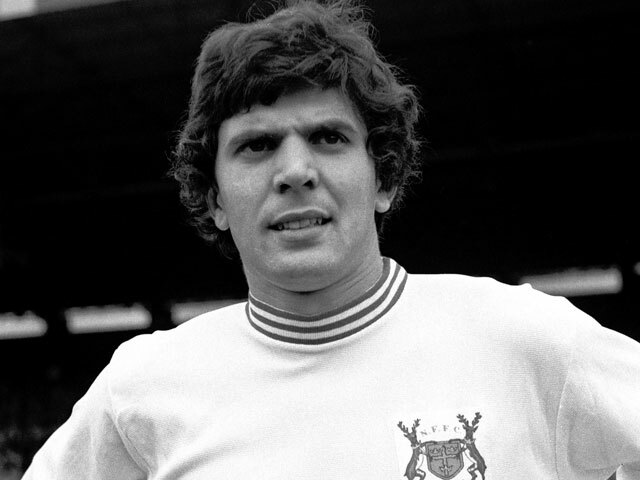 Peter was one of those players that represented a certain era for me personally – along with George Best and a select few he seemed to be part of a vanguard of young footballers who were part of the generation that I looked up to. Georgie Best had just been crowned ‘El Beatle’ after his exploits in the European Cup, and seemed a lifetime away from men like Bobby Charlton and the old guard. There was an awful lot happening in society at this time – The Beatles had grown their hair long and were taking drugs for one thing! ‘Flower power’ had been all around and young people were seeking the route back to San Francisco – with or without flowers in their hair. The footballers that I and my pals at school were most avidly collecting bubblegum stamp cards for were of guys that looked like Georgie…and Peter. Bobby Charlton and his generation were definitely ‘square’. A ‘Peter Cormack’ could be worth up to five ‘Alex Stepney’s’ on he bubblegum card black market! Peter had a very good time of things at Nottingham Forest’s City Ground by the banks of the River Trent. Although toiling in a poor and degenerating Forest side, years away yet from the new messiah Clough and just after an, at their best Joe Baker and Ian Storey-Moore – both golden boys to the Forest faithful, Peter played in midfield and scored creditably from that position for two seasons. He also added to his final tally of nine full caps in the dark blue of Scotland. The point that most of the local media and supporters picked up upon was the fact that many of those goals had been headers. Perhaps at first glance (no pun intended) this might have seemed unusual. Certainly Peter though by no means being a small man was certainly no towering giant in the penalty box either. His height alone was not the reason for his menacing ability in the air, but rather his perfect timing. Peter was one of those players that could put his head in where it mattered first. His exquisite timing also dictated that in a melee of players going up for a high ball in the box, his would be the one that appeared to ‘hang’ there in the air – often being at the peak of his leap, with his head on the ball when other lesser players were already on the way down to earth. At odd times in history these unusual players have identified themselves to the public eye but very rarely so. Other Hibs friends have told me just what a good goalkeeper Peter was ironically. The same talent and technique that gave him great jumping ability he could also use in the goalies shirt. One Hibby whose opinion I respect greatly is of the opinion that if Peter hadn’t become an International outfield player, he certainly would have been capped as a goalkeeper. Peter was neither a one-trick pony of a player either. His graceful play, passing ability and nimble footwork were a joy to watch. He had an array of crowd-pleasing tricks on the ball too. I have heard people say he wasn’t notable for his tackling ability but I’ve never necessarily subscribed to that notion having seen him dig in during midfield battles well. Of course whilst showcasing all this talent it became quickly impossible for Peter’s situation to remain the same. Bill Shankly at Liverpool had noticed the young Scot’s sparkling dis plays and wanted him as the last part of the jigsaw at Anfield. Peter was introduced to the Liverpool team after an, expensive for that time, fee of £110,000 and furthered a very successful career on Merseyside. for five seasons before being transferred to Bristol City. Similarly it has been my experience to note that those fans of Liverpool FC that ever saw him play, like those of Hibs and Forest have only very fond memories of his captivating style of play. A cursory check though any Liverpool website will confirm that. When I sometimes see the all-too-few pictures of, and information about Peter Cormack, in books and on the Internet I have to say I often wonder why others at times are more spoken of. Perhaps it’s simply that his years at Hibs were not more extensive. This however could be quoted in the case of Joe Baker and many other great and very good players at Easter Road. Those that do talk about him however usually glow about his skill and style – the way he played. Peter Barr Cormack’s way was the Hibernian way.